The Paprika Festival’s Tenth Anniversary Celebrations at Tarragon Theatre. Photo courtesy of The Paprika Festival. In this edition of Weekend Planner: help out the library by expanding your own, experience the best Parkdale has to offer, get acquainted with the next generation of theatre artists, agitate on behalf of social assistance, or get a super-early headstart on Toronto Beer Week. FUNDRAISER: Demonstrate your love of books and support of libraries with the Toronto Public Library’s annual Clearance Book Sale. Gently used books will be sold for fifty cents each or three for a dollar, with all proceeds going to support TPL programs. Beeton Auditorium, Toronto Reference Library (789 Yonge Street), Saturday, 9 a.m.–5 p.m., FREE. FESTIVAL: Parkdale celebrates its Fireside Cultural Week, culminating in a full day of concerts, street performances, prix fixe specials, and other events this Saturday. With mainstage performances at the Dufferin Amphitheatre headlined by Maestro Fresh Wes, and many of the shops and restaurants in the neighbourhood hosting everything from poetry readings to contortionists, the day promises to bring out the best of Parkdale. Parkdale Village (various venues between Dufferin and Roncesvalles along Queen Street West), Saturday, Mainstage 11 a.m.–6 p.m., FREE. THEATRE: Celebrating its tenth anniversary, the Paprika Festival showcases work by artists under twenty-one. On Saturday, performances titled Alligator Tears, Love and Its Dialects, Excuse Me, Would You Like To Buy A Bar?, Hold For Applause, and For The Greater Good alternate with workshops, panel discussions, music, and other performances. Sunday’s performances include The Ice Play, Hushabye, and Unravelled: A Queer Pastiche on Homonationalism. 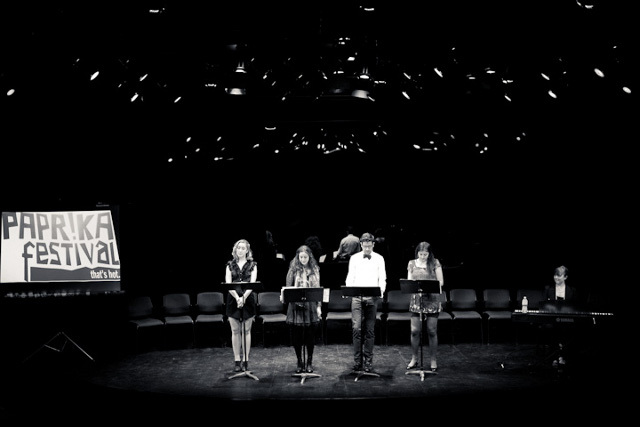 Check out the next generation of theatre artists. Tarragon Theatre (30 Bridgman Avenue), Saturday from 1 p.m., Sunday from 5 p.m., FREE. MEETING: The Ontario Coalition Against Poverty invites Toronto residents to the Poor People’s Assembly, a meeting to discuss strategies to challenge the removal of the Special Diet Allowance, which provides financial help to social assistance recipients with conditions such as diabetes, and to increase and improve welfare and disability assistance. The assembly will offer childcare and translation services. Davenport-Perth Neighbourhood Centre (1900 Davenport Road), Saturday, 2 p.m., FREE. BEER: Toronto Beer Week may be six months away, but its organizers want you to start your countdown early, with two simultaneous pub crawls this Saturday. The curated tours will emphasize local craft brewers, and some of the pubs visited will offer one-off beers. A downtown crawl, hosted by Cass Enright will hit the Queen and Beaver, The 3 Brewers, Duggan’s, beerbistro, and C’est What. Further west, a crawl hosted by Troy Burtch will stop at the Cloak and Dagger, Caplansky’s Delicatessen, Burger Bar & Tequila Tavern, Harbord House, and the Victory Café. The Queen and Beaver (35 Elm Street) or the Cloak and Dagger (394 College Street), Saturday, 2 p.m, FREE to attend (pay what you drink), RSVP info here.